Interbrand, in addition to ranking the brands, also provides estimates of value with Apple’s brand name value estimated at $98.3 billion and Coca Cola’s at $79.2 billion. Sale of a brand name: If a company is considering selling its brand name alone, while holding on to its physical assets, you have to be able to value the brand name separately from the rest of the business. Legal disputes over brand names: Brand names become the subject of legal disputes, with each party claiming the lion’s share of value. Without knowing how to value the brand name and the drivers of that value, you cannot apportion the value to the disputing parties. Accounting “fair value”: The shift in accounting towards fair value from original book value has opened the door to accountants also trying to estimate the value of intangibles such as brand names, trademarks and customer lists. While I don’t think this is a good idea and have said so in other forums, it is clearly the trend in international accounting. Advertising spending and evaluation: If one of the key roles of advertising is building up brand name, understanding how much brand name is worth is key to both how much you spend on advertising and how you spend it. It is also a critical component in assessing the effectiveness of advertising in delivering a higher brand name value. Pricing and product decisions:The products that you offer and how you price them will depend can be affected by and can have an effect on your brand name value. Thus, if you are an elite brand name apparel company, you may choose not to introduce a lower priced product out of fear that it will hurt your brand name and thus your value. While there are some who bunch together all of the competitive advantages possessed by a company into the “brand name” category, I think we are better served isolating brand name from other competitive advantages. Consequently, I have a narrow definition of the power of a brand name, which I am sure that some of you will take issue with. Brand name power: The power to charge a higher price than your competitors for an identical or almost identical product or service. The generic aspirin was priced at $2.25 and the Bayer version was priced at $6.00. Aspirin, of course, has been off patent for decades and the ingredients in Bayer Aspirin and its generic counterpart are identical. Clearly, though, there are customers who are willing to pay a premium for the Bayer Aspirin, notwithstanding that reality. In fact, you can find multiple examples of this generic/brand name price disparity through grocery stores and pharmacies. So, what explains the pricing power of a brand name? It would be far too easy to get on a soap box about consumer irrationality, but I would not dare to do so, because I am sure that we have all been guilty of this irrationality, if not with Aspirin, with other products. Brand name power is a testimonial to how our choices as consumers are driven not just by product characteristics and prices, but also by an array of behavioral factors. It is no wonder then that the secrets to creating a valuable brand name are shrouded in mystery. If it were just spending advertising dollars, the big ad spenders should dominate this list of top brand names but there are many who don’t show up. Conversely, there are companies that seem to come out of nowhere and become valuable brands in short periods: Snapple in the early 1990s, Lululemon and Under Armor in the last few years. Brand name value is as much a function of luck and serendipity as it is a function of planning and design. If you accept my definition of brand name power, the process of valuing it then becomes simple, at least in the abstract. It would require you to answer the following question: If you are a brand name company and you lose your “brand name” overnight (consumers develop selective amnesia), what would happen to the value of the company? That question is easier posed than answered because facile comparisons don’t quite capture the effect. Thus, comparing the market capitalization of Coca Cola to the market capitalization of a generic brand name company will tell you little about brand name value. While the comparison of pricing multiples (PE, PBV or EV/Sales) between brand name companies and their generic counterparts are more useful, there are still too many unknowns to control for. As I see it, the only way to value brand name is to use an intrinsic valuation model, identify the drivers of value and then look at how brand name and generic companies differ on those drivers, with consequences for value. Note that Coca Cola’s after-tax operating margin of 17.07% is almost 3.5 times higher than Cott’s after-tax operating margin of 4.08%; the return on capital for Coca Cola is 16.54%, 9.23% higher than its cost of capital of 7.31%, whereas Cott’s return on capital of 7.73% lags its cost of capital of 8.51% by 0.78%. 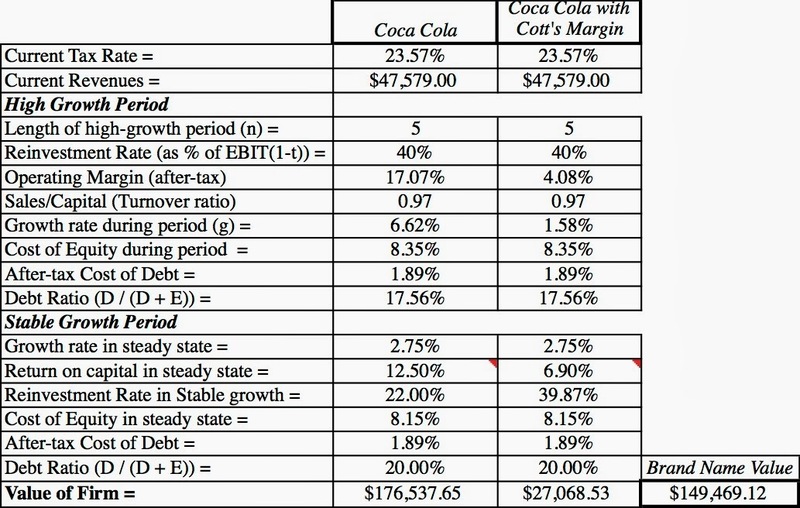 Option 1 (Coke's margin = Cott's margin): Assume that Coca Cola loses its brand name overnight and that it’s operating margin converges on Cott’s operating margin of 4.08%. That drop in margin has ripple effects, lowering the return on capital and growth rates. Holding revenues and the cost of capital fixed, that translates into a value for Coca Cola’s brand name of $149.5 billion. 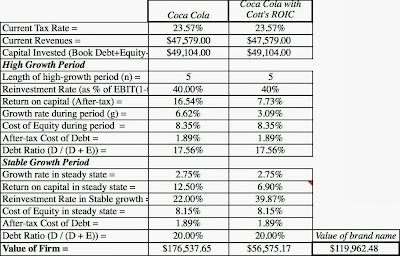 Option 2 (Coke's ROIC = Cott's ROIC): One reason that option 1 may over estimate the value of the brand name is because Cott is more efficient in generating revenues per dollar of capital invested ($1.89 per dollar of invested capital) whereas Coca Cola generates only $0.97 per dollar of invested capital. 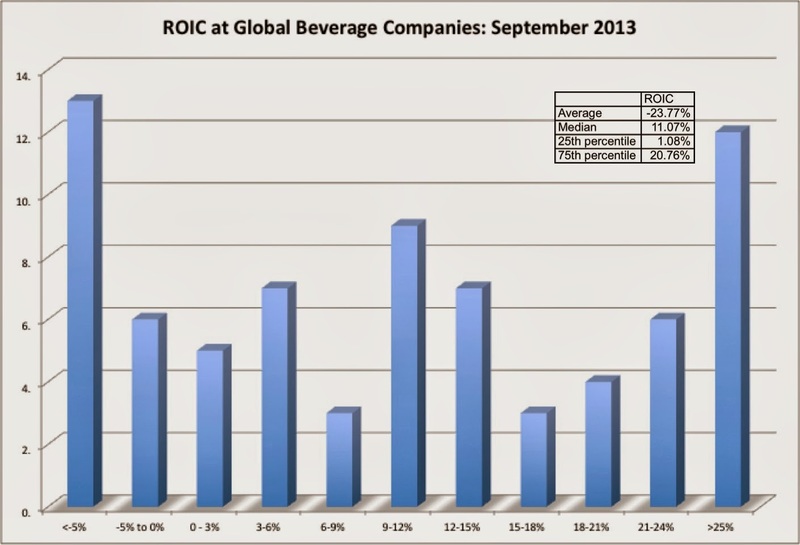 Giving Coca Cola both the margin (4.08%) and the sales to invested capital ratio (1.89) that Cott has effectively gives it Cott's ROIC (7.73%) and this reduces the value of the brand name to $120 billion. 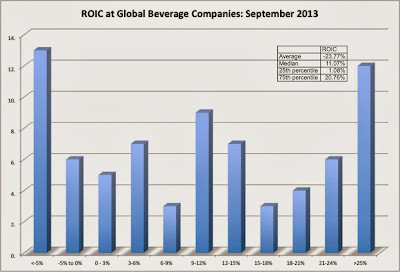 Note that the distribution is split, with lots of companies at either end of the distribution: high ROIC and low ROIC. You can then use the median ROIC (or some lower percentile if you prefer) of the sample of 11.07% as your generic ROIC and use it in your valuation). 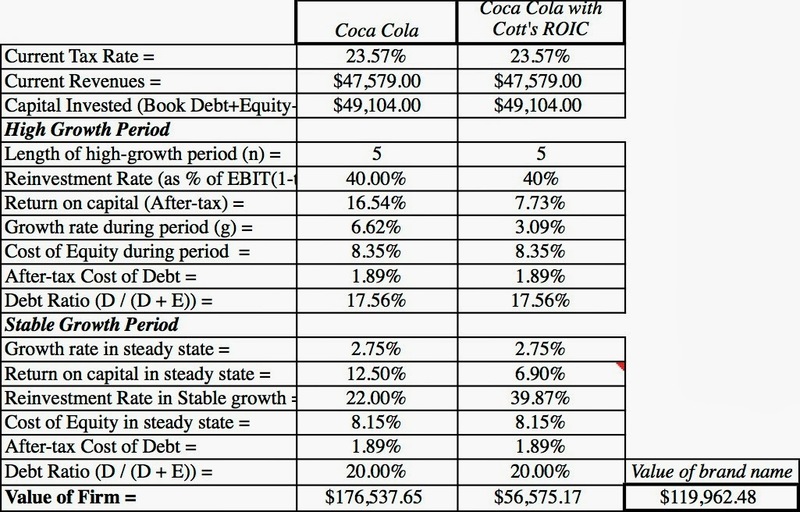 There are other choices that you can make: that all of the excess returns are due to brand name, that Coca Cola earns the same excess returns as Cott etc. The value for the brand name ranges from $90 billion to $150 billion, depending on your choices and you can see them all in this spreadsheet. Note that this approach works well for Coca Cola, since there is little else other than brand name that separates one sugared, colored beverage from another. It is much more difficult to do this analysis for Apple, where you can argue that pricing differences are only partially driven by brand name and can also be explained by differences in operating systems, features and quality. Thus, while we can estimate the portion of Apple’s value that can be attributed to all of these competitive advantages collectively, parsing it among the advantages can be in the eyes of the beholder. Brand name is one of the most sustainable competitive advantages in business: There are very few competitive advantages that have survived as long as brand name. A technological edge can be lost and economies of scale can be matched but brand names often endure the slings and arrows of competitive fortune. Brand name is not the only competitive advantage: Not all valuable companies have a valuable brand name (Eg. Walmart, Exxon Mobil) but they have other competitive advantages; Walmart’s edge comes from unmatched economies of scales and supply chain management whereas Exxon’s come from its reserves). Even some of the companies on the Interbrand list have questionable brand name values. As I see it (and I am biased), Microsoft’s competitive advantage has not been its brand name. With both Windows and Office, the company has used a mix of overwhelming force (packing the products with features that most of us never use) and a networking effect (where not using them makes you the odd person out) to win. Misidentifying your competitive advantage can be dangerous: You may feel that the parsing of competitive advantages that I am doing is pointless, since they all lead to excess returns, but I do think that it matters. If you do not know what your true competitive advantage is, it will not only be difficult to nurture it but you may put it at risk with your actions. Thus, while brand name value is a sustainable advantage, its benefits can still be lost by careless, deluded or distracted managers. A classic example is Coca Cola’s ill-fated attempt in 1986 to introduce New Coke, in a misguided belief that it was taste that mattered, when in fact it had little to do with Coca Cola’s success. Investor alert: If you are an investor in a company whose primary competitive advantage is brand name, the primary risk you face to your wealth is not that the company’s growth will lag (though that is always a concern) but that its pricing power will dissipate. In pragmatic terms, investors in brand name companies should track operating margins at these companies, staying alert to slippage. Great Post! So can I conclude that only companies that have higher (relative) margins and (relative) returns by selling similar products have brand value? Is there an approach that I can use to calculate brand value for companies like Wal-Mart, Amazon (kindle loss leading) and Dollar-Tree? However, I have a query: Apple's brand value increased by 28% but there product portfolio is getting very similar to the competitors. My question is how long can a company cash on to its brand value specifically in a technology company? Is it not a early indicator of change in value drivers of the company? Interbrand claims that Apple's brand name value increased by 28%. I don't buy it, since the company has seen shrinking margins over the last year. Using my approach, I would have derived a lower brand name value for Apple (and I am not sure it even measures brand name only). I don't think Wal-Mart or Dollar-Tree have any brand name value. Would you pay a higher price for a product at Wal-Mart than the same product elsewhere? I don't think so. Amazon might have brand name value insofar as it has developed a reputation for trust and timeliness (key factors in online purchase). To value it, though, you cannot use the spreadsheet that I have attached because Amazon has not exploited its brand name value (yet) to deliver higher margins. That is Jeff Bezos' promise to investors: that he will find a way to deliver this profit. Your analysis is great and coke is a good selection. Coke seems to have only brand name nothing else, i.e. no other competitive advantages. I wonder why this sugary soda has been so much admired by people for such a long time. They have been stupid for way long, hope they reason out some time soon. I expect coke's brand (and consequently value) will reduce significantly over the period. Perhaps you would not buy a product for a premium at Walmart or Dollar General, but if you are going shopping and can drive equal distance to Walmart or an off-brand store, which would you pick? For retailers, there is value to getting customers to gravitate to your store. Sir, two follow up questions. Firstly,if I take a company like Space-X or any belonging to a nascent industry with almost no competitors.Does the company have no brand value? Secondly as of July 31st 2013 WMT has good will listed at 19.28 Billion. Does that mean that Wal-Mart have overpaid for something and is it reasonable for me to back that number out of the market cap in-order to make my valuation (relative to market cap) of WMT more accurate. Thanks in advance! I would think that you are driving to Wal-Mart either because you believe that they are more likely to have it in stock (a testimonial to their inventory policies) or because they will have a lower price (that comes from their economies of scale). Neither strikes me as a brand name advantage, but you may view this as nit picking. Since SpaceX has no revenues or income, I cannot see how brand name even enters the discussion. If you are buying it, you are buying it as an option. As for goodwill, don't do anything rash. Read my blog post from a few months ago on Goodwill. While brand-name can give you power to charge more, if brand-name is not your competitive advantage, then you may not have that power to charge more. Am I summarizing it correctly? I'm thinking about Google. It has a strong brand, but it gives away Android for free and Google Apps are cheap. Would one be willing to pay more for Android or Google Apps given Google's brand equity? 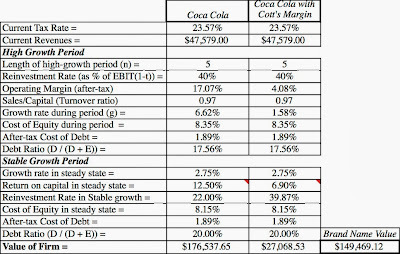 In the input sheet (Coke),for cost of capital calculation for both the companies, effective tax rate is considered. Should we use marginal or effective tax rate? It should be the marginal tax rate for the after-tax cost of debt. I considering adding an extra line item for it but decided against it since I wanted to keep the process relatively simple. But you can always augment the spreadsheet by adding it. Just to remember the polemic of Tesla article. Thanks Prof. for clarification. When I use 40% marginal tax rate (instead of 23.57% effective rate) for terminal value calculation the firm value comes to 143,738 instead of 176,538. I am not surprised. But remember that Coke is a multinational company and it just holds the cash in foreign markets now (as trapped cash). Will it bring it back to the US one day? Perhaps, or it may just choose not to be a US company. The battery is really a competitive advantage or Tesla's weak point? "TESLA'S ELON MUSK DEFENDS MODEL S ELETRIC CAR AFTER FIRE"
"Tesla Motors Chief Executive Elon Musk moved Friday to put out the financial fire that resulted from when one of the electric car company’s expensive Model S hatchbacks burned up on a roadway near Seattle this week. Writing on Tesla’s website, Musk explained how a big chunk of metal that fell from a semi-trailer impaled the undercarriage of the car and started a fire that was contained to the front battery module. “Had a conventional gasoline car encountered the same object on the highway, the result could have been far worse,” Musk wrote. The fire raised concern that the luxury car might have some sort of flaw with its lithium-ion battery system that could be costly to fix or would spook potential buyers. Tesla shares plunged from $193 at the close of trading Tuesday to an intraday low of $168 on Thursday, a 13% decline, before rebounding to close at $180.98 on Friday. Tesla has seen a huge run-up in its stock this year as it has ramped up sales of its luxury electric cars, which start around $70,000. The stock was $35.36 on Jan. 2." Hi professor, thank you for sharing your brand valuation methodology. Just wondering what do you think about the other commonly adopted brand valuation methodology adopted by accounting valuation firm. E.g return on royalty method (ROR) and multiple period excess earnings method (MEEM) for IP/brand/trade mark valuation purposes. Regarding the Walmart brand value argument, consumers may base their buyer decision on the brand's reputation, trustworthiness and credibility to honor refunds/exchanges on products such as appliances. Wouldn't one's preference to shop at Walmart over its competitors for this reason (which shoppers may even pay a premium for) suggest there's brand value? I would pay more for a product that's associated with a reputable retailer based on the business's credibility to honor refunds etc. My only point is that some well branded firms like wallmart, for instance, has a great brand value but offer less price than what competitors do. So, my question, is how does your definition stand in these cases where the firm's brand value and the major competitive advantage derived from its low price offering? please have a look and let me know your take on it. I like the way you written the blog. Post is very informative. Thanks for sharing such a nice information on branding companies. hi, how to value a company which is not the owner of a band but has got a brand license from some another company and markets its product under that. How is valuation impacted incase the brand owner decides to sell the brand? Extremely insightful post professor. I have a question. Can the same method be used for a company that has a 'house of brands' strategy or do we need to consider the financials wrt each brand under the company?